Rabbi Tsafi Lev, is the West Coast CLAL Rabbis Without Borders Student Director. 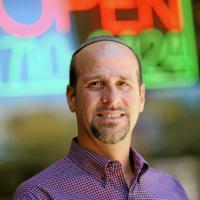 He is also the Rabbinic Director of New Community Jewish High School in West Hills, CA. What does it mean to be The Jewish State? As a rabbi, teacher (high school), parent, and former child let me confirm that the central issue for Kayla (Elsie Fisher) is unlike anything we adults had to manage when we were young.